The Photos (previously known as Pictures) hub is also pretty much the same as we left it in Windows phone 7.5. And of course, the point of hubs is that they are the go-to place to do things, instead of apps. New functionality allows apps to integrate into the Photos hub, so for example, a photo effects app can make its options available right in the hub. Devs need to enable that into apps however. Albums feature the camera roll, the preloaded system pictures and all of your Facebook albums. A flick to the left shows all your pictures sorted by date. You can't assign individual camera roll photos into albums, though. The people section is where you can select your friends or closed ones so that their galleries on Facebook get displayed right there in your Photos hub. It's a nice feature for social network users but will be only an empty section for those that aren't too fond of Facebook. Sharing options include messaging, email, Facebook or the cloud-based SkyDrive. The media players reside together in the Music & Videos hub, which now bears the Xbox logo or the last played media thumbnail. When you start it, it shows the History, which gives you quick access to the last two things played, or you can go to the full menu and start the music or video player, listen/watch podcasts (both audio and video podcasts are supported) or go to the Marketplace. The HTC Windows Phone 8X supports Beats Audio and you'll find the toggle deep in the settings menu, instead of the music player settings. Beats Audio boosts the volume without involving loss of quality. Update: Since the GDR2 update, the 8X now has FM Radio support, as well. The video player is integrated into the Music + Videos hub. It has a very simple interface - you have fast forward and rewind controls, a time scroll and a video size button that toggles full-screen viewing. The video player in Windows Phone 8 has greatly improved codec support since our last encounter. Now it does recognize pretty much every Xvid, DivX and MP4 videos up to 1080p resolution. The few things it won't play are MKV files and videos using AC3 audio codec. While this is not perfect, it's much better than before. There is no subtitle support just yet. Since Windows Phone 8 is Zune independent, you can easily upload videos from your computer via the USB mass storage mode. 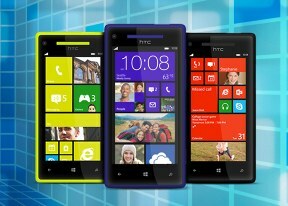 Judging the HTC Windows Phone 8X audio quality is a tricky job. HTC intended for you to listen to the smartphone with Beats audio enhancements enabled in which case the smartphone is one of the loudest around. The problem is enabling Beats also triggers an equalizer (which is otherwise unavailable and this means you won't be getting the pure experience audiophiles demand. 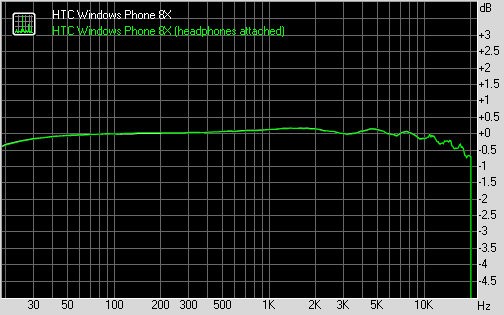 Switching Beats audio off still gives you good performance, but only average volume levels. Most of the readings are excellent remain good but the intermodulation distortion is slightly high and the stereo crosstalk is not the best we have seen either.